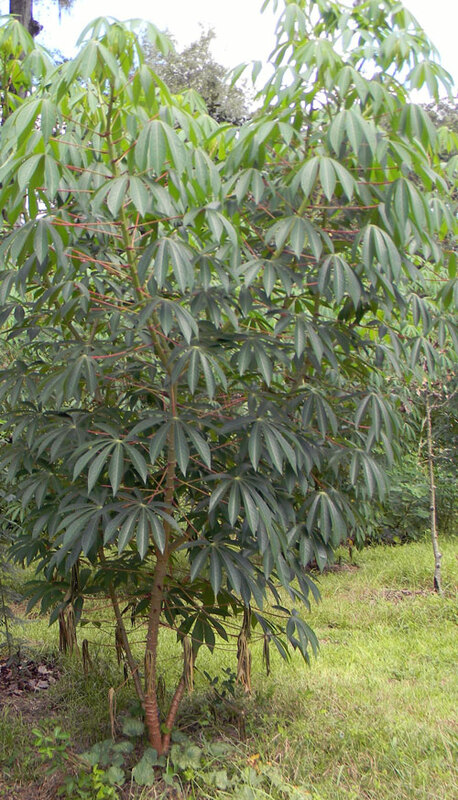 Are you looking to buy cassava cuttings? Inside the US, cassava is generally unknown except among some ethnic minorities. Yet it’s where tapioca comes from (or “fish eyes,” as my Uncle Stuart calls them) and has been used as a source of laundry starch. The roots are really, really high in starch. 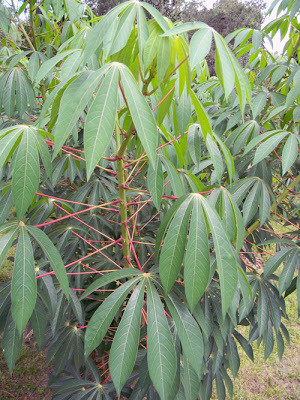 Growing to about 12’ tall, the cassava plant looks very tropical. Its palmate leaves and graceful cane-like branches are attractive in the landscape or in the garden. Cassava’s pseudonyms include yuca (with one “c,” NOT two – “yucca” is a completely unrelated species), manioc, the tapioca plant, and manihot. In Latin science-speak, it’s Manihot escuelenta.Whatever you call it, it’s a serious staple crop. Virtually pest-free, drought tolerant, loaded with calories, capable of good growth in poor soil – cassava is a must-have anyplace it can grow.And it’s MUCH less work than grain and much more tolerant of harvest times. In fact, once it’s hit maturity, you can basically dig it at any point for a few years (though the roots may sometimes get too woody to eat). 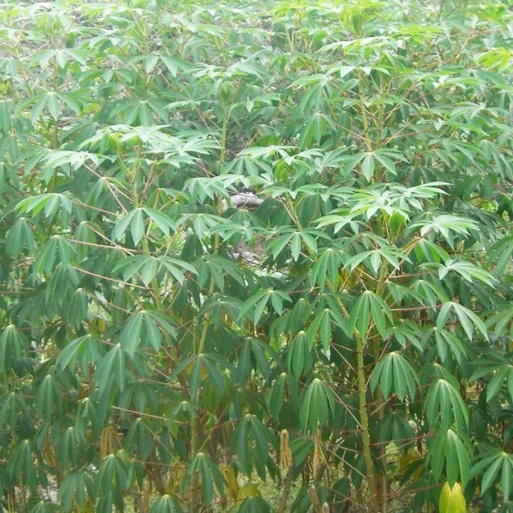 But there is a caveat on cultivation: cassava doesn’t like cold. At all. If temperatures drop to freezing, your cassava will freeze to the ground. This won’t usually kill the plant, but it does mean you need to plan your growing accordingly. In the tropics, cassava is a perennial, capable of growing huge roots and living for years. Here in Florida the plant does well until you get north of zone 10, then the occasional frosts will knock it down. Growing it at any zone beyond 8 is likely an exercise in futility. Cassava needs warm days and nights to make good roots. And speaking of roots… the cassava’s roots contain roughly twice the calories of a comparable serving of potatoes. Bonus: they’re easier to grow. Of course, there is the cyanide to consider. What – you didn’t think a plant this awesome could exist without a down side, did you? The plant is full of it, from its lovely leaves to its tasty roots. Fortunately, boiling or fermenting gets it out, so fear not. A lot of plants we eat are poisonous. Just google the “cashew tree” or look up the toxicity of dry kidney beans. Compared to many things we eat, cassava’s pretty tame. 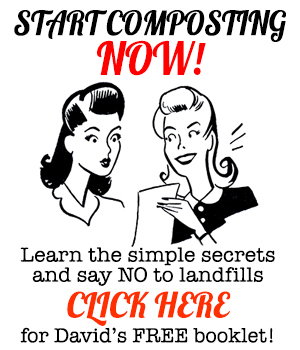 Now – moving beyond the cyanide – how do you grow these things? Unlike many plants, cassava is not usually grown from seeds except for breeding purposes. The only way most folks grow it is via stem cuttings. 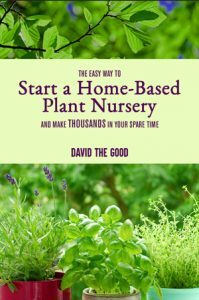 and cover them lightly with soil – or, as I plant them, stuck in vertically with the growth buds pointing up – and within a week or so they’ll be growing new leaves. 6-12 months later (depending on care and rainfall), they’ll be ready to start harvesting. To harvest, machete down the entire plant a foot or so from the ground, throw the branches to the side and start digging. Be careful, though – the roots are easy to chop through. Some careful exploratory digging with a trowel is often a good idea. The roots you’re looking for grow down and away from the main stem and are generally located in the first 1-2’ of soil. They’re deep brown with flaky skin. Don’t dig them too long before you’re going to process them as cassava doesn’t store well at all. 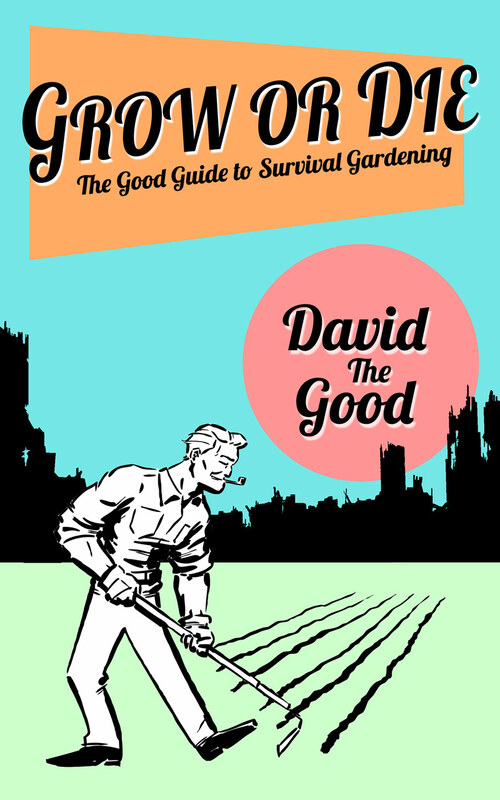 Once you harvest the roots, you’ll want to chop up the rest of the plant to make a new set of canes for planting out. I snap off all the leaves and compost them, then cut the bare canes into planting size. Canes that are too green tend to rot rather than root, so throw them on the compost too. Sturdy, 1-2” diameter canes are perfect. Plant them a third of their length or so into the ground and stand back so the new growth doesn’t knock you over. Just don’t plant them upside-down. Ensure they’re right side up by looking for the tiny little growth buds by the leaf bases (or where the leaves were before they hit the compost bin). That little dot should be above the leaf’s base, not below. Preparing the roots is another post for another day. The Cassava plant is a must-have in warm climates, but even at the edge of its natural range you can push it. You can bury cut canes in a box beneath the ground for the winter, as a Cuban friend told me her family does… you can let your current plants freeze to the ground and just wait for spring to bring new growth back… you can put cuttings in pots and bring them inside on freezing nights, then plant out in spring… or you can get a greenhouse and always keep a few plants in there for propagative stock. And as for work, the worst part is the harvesting. View it like digging for treasure and it’s fun. Another great thing about this plant: its leaves are also edible (boiled, of course – remember… CYANIDE!) and rich in nutrients. The young leaves are best and remind me of a drier-tasting collard green. Not bad. At harvest time I usually grab a few baskets’ worth for the table or the freezer. The roots can be chopped and frozen raw as well – they keep quite well that way. Start learning this plant. It’s literally a lifesaving staple in Africa. You can find cassava cuttings for sale here on ebay. cut them before a frost. stand them in a warm corner, come spring they will start growing. Hi David, I need some help finding Cassava cuttings. I'm pretty good on the google-fu, but I'm not turning anything up. Any suggestions? Thanks! They're really hard to find. I keep getting asked about them… I can barely grow enough for myself. However – I've decided to start a small nursery operation, just so I can connect people with plants like these. I've got a plan to grow out a bunch in my greenhouse so I can have cuttings available. That would be great! Also, you might find yourself in a whole new career path. 😉 I'm in the Central Florida area. I'll send you a message with my email address for when you have some cuttings available. I'm glad I found this article. I really want to plant some cassava this year. I live near Gainesville, fl, and I'm not sure cassava will do good here. If it is possible for me to get some cassava cuttings from you, then I would be very grateful. It is so hard to find cassava cuttings. I have been looking online and I found this and it gives me hope. I can hook you up. Drop me an e-mail from the contact link. I no longer have them for sale – try Grower Jim at Garden Adventures. Curtmar also check out Oliver and Joe with Abundant Edible Landscaping… they are in Gainesville… google will get you a number. I got cassava and all sorts of other goodies from them. AEL is a great place. NW Alabama would be a stretch, but I'll bet you could do it by mulching the bases heavily. I'd totally go for it. I do have a limited amount of plants available for sale right now – get in contact via the e-mail link on the upper right hand corner and we can talk. I'd love to hook you up. Hi David, Received the cuttings you sent! Thank you!! 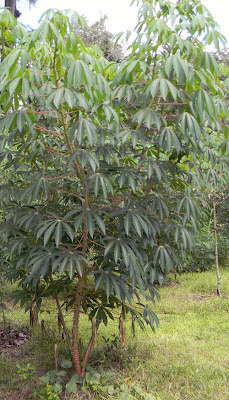 Cassava will grow in partial sun, but not impressively. The deeper the shade, the poorer the growth. I have some in full shade that is thin and leggy with no root growth… and some in partial shade doing so-so. It's definitely a tropical sun hog. I've grown malanga from the roots in the grocery store. It likes damp (even boggy!) conditions. I've also gotten roots from Puerto Rican friends. Good luck! South Florida is the best growing zone in the state. Hi David, I live in Central Florida and I have yuca growing. My yuca plant is currently full of fruit. My question is can the seeds of the fruit be used to grow more plants? Yes, though the varieties you get may vary in "bitterness," i.e. cyanide content. A co-worker and I were waiting for these to be available and we somehow missed your window. We've been watching since last fall. I hope you can help us acquiring some plants in your next harvest. Thanks for making these available to us all, obviously you have a great idea! Hope we can part take in your next batch. I live in SE Florida, and grow Cassava in my yard. I propagate it, and have plenty of stock. However, I have never sold any. Contact me if interested. Thank you. 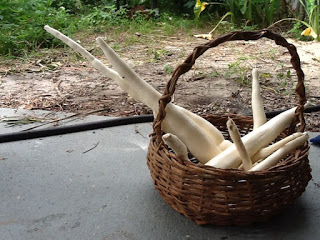 I live in Seminole County, FL and would love to try my hand at growing cassava. Any possibility I can get a cutting from you. Please let me know if this is possible. Thank you! Will it grow in Arizona? We have a variety of zones; 4,5,6,7 in the mountains and zone 13 in Phoenix. I'm sure it will. Not in 4-7, but a warm 8 onwards. 9 and beyond is best…. quicker production and no waiting for it to come back from frosts. I have a limited amount at the moment – e-mail me off the e-mail link on the sidebar. That's a long time to keep the stems. I'd plant them in pots right now, then bring them in during the freezes. This is a really interesting article. Growing cassava in this part of the world versus the Tropics certainly seems challanging. For people like myself who's originally from Liberia, West Africa, who has seen and eaten cassava in its many forms, I would just say that your article brings back beautiful memories for which I thank you. One thing though; I believe you live in Florida. There must be some Liberians living in some of the larger cities there. If you ever happen to come accross a Liberian, ask that person about "cassava leaf." This is a Liberian dish in which the primary ingridient is the leaf of the cassava plant. It is usually cooked with meats and fish. Any chance you get to try it, if the opportunity arises, do so and you'll never forget the experience. Guranteed. Again, thanks for the article. I've seen a video of someone making a similar dish from the leaves but I've never been able to try it. I'll keep my eyes open for Liberians! And yes… cassava is easier, faster and more productive in the true tropics, though I'm still grateful I can pull it off here. The cuttings I got from you last year are growing like mad! I love the tropical look they add to my landscape. People are always asking me what they are. I don't know how to use the roots and look forward to a post about how to use them. Keep up the good work, I've learned a lot from you ! gretchenpm@gmail.com PLEASE let me know if I can buy cuttings form you! We'll have them again in the summer – sold out right now. seven years.I’m glad to find your website,could you help find the cuttings so I’ll plant them next spring. I should have some for sale soon – thank you. I’m interested in your yuca as well. Let me know when it’s available. Thanks! Can it take longer than a week for growth to appear on a cutting? I think it’s been 2 or 3 weeks since I put them in the ground and nothing yet… It’s warm out. Yes – they like it good and hot out. You won’t find seeds – you need cane cuttings instead. Cassava is an everyday experience here in Ghana, West Africa. The root of the Cassava plant has many uses whether in the raw state or processed. It is a staple food that is widely used all over the country. In its fresh state, it is cooked and pounded and taken with soup, which we call “fufu”, or dried, pounded and milled into flour and made into paste which we call “kokonte” also taken with soup. However, we do not use the cassava leaf in Ghana. Your article was very interesting for someone like me who experiences the plant and its numerous uses on a daily basis. The surprise is that you are now finding out about this plant of numerous uses. In the USA cassava is rare, as it cannot be grown in most of the country due to the cold weather. Thanks for sharing the many ways you use it in Ghana. Can you direct me to a site in South America where I can buy non-hybrid i.e. heirloom cassava stems? Or do you have them yourselves? I’m not sure; however, I would think most of the ones grown by small farmers would be heirlooms. Dunno, though. When I saw Cassava roots at the grocery store, I remembered I had read something about growing Cassava on your website. I should have re-read it before buying, because it looks like the root won’t grow. Any chance to get it to sprout with an alternative method? Dave do you know if cassava cuttings can be shipped into The US , or do you know if the US customs will size it. I want to to start a cassava farm in south Texas . May be on a 5 arc farm.